Your Keep is the heart of your City, and unlocks a plethora of things to do. 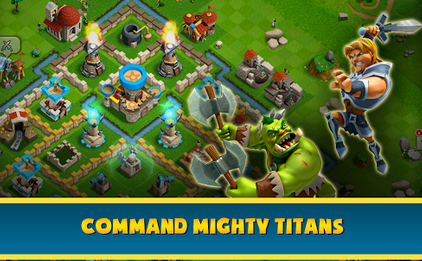 Spend your free Treasure to get awesome items and even recruit new Titans. You can equip up to 3 items an each Titan you have. There are lists of items in equip, and each gives a unique advantage! Start milling Essence right away to enable us to attack and build faster! Essence is a magical resource used to speed up timers. An extra builder would really help speed things up! Upgrading your War camp will increase your maximum army size. The Barracks is where we prepare our troops far upcoming battles. With a properly trained army, you can defeat enemies in no time! Alright, more Treasure! You'll get free Treasure every 6 hours us well as every time you going a new rank. You can use EXP Flasks and unwanted Items to upgrade your Titan skills! An elite or Academy means more strategic options for your army. Earn piles of Diamonds by completing these objectives! Any duplicate or unwanted Titans can easily be converted into Titonite! If you've sacrificed items or spent Titonite to level the Titan you ore converting, you get fully refunded what you've spent on them.